Slab house plans are the easiest foundation type. They are flat concrete pads poured directly on the ground. They take very little site preparation, very little formwork for the concrete and very little labor to create. They work well on level sites in warmer climates where Beach or Coastal, Sunbelt, Florida style, or Adobe style house plans are built. 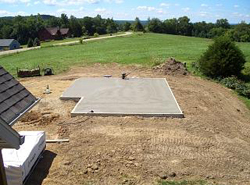 House plans with slab foundations have problems up north because the ground freezes in the winter and this freezing can shift the slab at worst and at least lead to cold floors in the winter. One downside, they offer no space for extra storage or future growth if necessary. The Lefton Prairie Ranch Home has 4 bedrooms, 2 full baths and 1 half bath. 2175 Sq. Ft., Width 50'-0", Depth 73'-0"
The Patterson Luxury Craftsman Home has 4 bedrooms, 4 full baths and 1 half bath. 4372 Sq. Ft., Width 68'-6", Depth 102'-0"
The DeMere Luxury European Home has 3 bedrooms, 3 full baths and 1 half bath. 4352 Sq. Ft., Width 100'-6", Depth 97'-0"
The Prichard Luxury Craftsman Home has 4 bedrooms and 3 full baths. 3459 Sq. Ft., Width 70'-0", Depth 53'-0"
The Wyman Rustic Prairie Home has 3 bedrooms, 2 full baths and 1 half bath. 3278 Sq. Ft., Width 138'-0", Depth 91'-4"
The Cricket Creek Country Home has 3 bedrooms, 3 full baths and 1 half bath. 2294 Sq. Ft., Width 71'-2", Depth 64'-6"
The Dewberry Falls Ranch Home has 4 bedrooms, 2 full baths and 1 half bath. 2000 Sq. Ft., Width 63'-0", Depth 62'-8"
The Shetland Tudor Home has 4 bedrooms, 3 full baths and 1 half bath. 2342 Sq. Ft., Width 70'-0", Depth 64'-0"
The Parkgate Craftsman Home has 3 bedrooms and 2 full baths. 1292 Sq. Ft., Width 51'-6", Depth 77'-0"
Our collection of house plans with slab foundations are a perfect choice especially in warmer climates. We offer detailed floor plans that allow the buyer to review the look of the entire house, down to the smallest detail. With a wide variety of slab home plans, we are sure that you will find the perfect house plan to fit your needs and style.